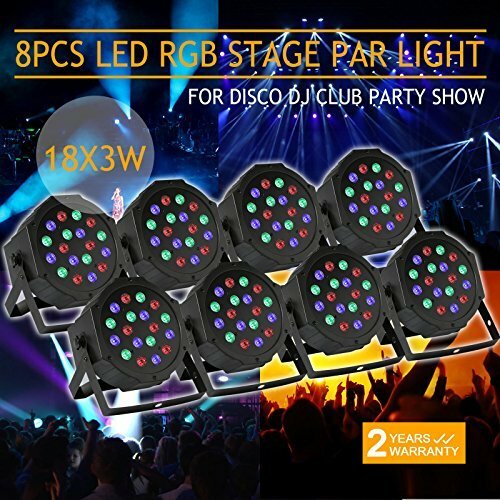 This 8pcs 18*3W LED 7 Channel RGB Stage Light is a perfect choice for you to have all kinds of stage, party lighting and decorate your place.It use the latest LED technology, Adopt 18(red 6 + green 6 + blue 6), each 1w high power Top grade LEDS, high brightness and low power consumption, bright color.Its bright light can be changed automatically according to your settings and also enables various visual patterns such as gradient color and strobe with adjustable speed. Built-in automated programs via stand alone mode by Menu Button. 8 Light Digital LED Display Very low power consumption,high output. Power: 18 x 3W(6pcs Red, 6pcs Blue, 6pcs Green) / Warranty: 2 Years. Voltage: AC 110V ; 60Hz / 7 channels. Can pull up numerous kinds of color effect, Stroboscopic effects with adjustable speed etc. Great for club, DJ show,disco, home party, ballroom, KTV, bar, stage, club, party, wedding, home decoration and festival etc. If you have any questions about this product by XeeStore, contact us by completing and submitting the form below. If you are looking for a specif part number, please include it with your message.